The church of Our Lady of Walsingham & the English Martyrs is a chapel-of-ease in our parish. That means it belongs to the parish of Our Lady of Mount Carmel & Saint George, and is served by the same priests. Together the two churches form a single parish community. Please note that the church is only open when there are services. The parish church, Our Lady of Mount Carmel & Saint George, is open every day for private prayer. The Westminster Diocesan Children’s Society opened St Joseph’s Home on Holtwhites Hill in 1890, and a community grew around Sunday Mass in the chapel. 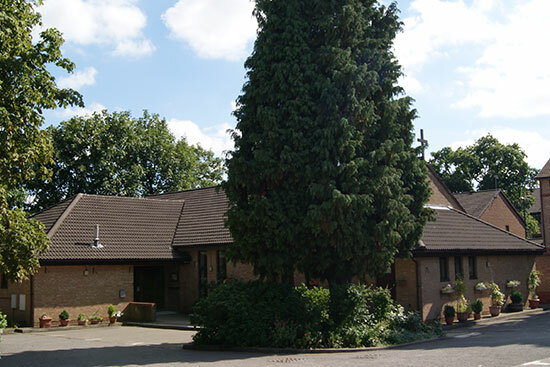 In 1964 the parish of Our Lady of Walsingham was established at St Joseph’s, but when the home closed in 1980 Our Lady of Walsingham became a part of the parish of Our Lady of Mount Carmel in Enfield Town. The particular dedication of parishioners from Holtwhites Hill resulted in the building of a new church in 1987, and just last year we welcomed Archbishop Vincent Nichols to celebrate the church’s 25th anniversary. Our Parish Priest is assisted in the running of our chapel-of-ease by the Our Lady of Walsingham Committee. The Syro-Malabar Church has a community that worships in Our Lady of Walsingham & the English Martyrs. Our Lady of Walsingham & the English Martyrs is near the top of Holtwhites Hill not far from Chase Farm Hospital.